Browne’s menswear line was created as a response to the broad acceptance of business casual in lieu of formal attire. 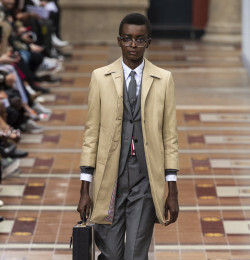 Since its debut in 2001, the Thom Browne collection has extended into a more complete menswear line with dress shirts, sweaters, ties, underwear, and accessories. Thom Browne can be purchased at retailers around the world and at the flagship store on Hudson Street in TriBeCa. A Thom Browne suit is distinctive in structure and fit. The suits are composed of flat front pants with exposed ankles and a jacket that concludes mid-wrist and doesn't cover the backside. They almost always have three buttons, narrow lapels rolled to the middle button, side vents, and trouser without belt loops. The designer is best known for wearing suits in a range of charcoal-grey colors, always paired with a tie cut from the same fabric, a silver tie clip, a white button down shirt, and black leather dress shoes.